A new entry-level model has fueled even greater interest in all things Jeep. The Jeep brand is marking its 75th anniversary this year. Founded just prior to the United States’ entrance into the Second World War, Jeep was a Government Purchase (GP) vehicle based on the Bantam Reconnaissance Car, a design accepted by the US Army. Both Willys-Overland and Ford were contracted by the federal government to manufacture what later became known as Jeep, a model engineered to successfully navigate the toughest battlefield terrain. Following the war, “Willys” began manufacturing civilian versions and won exclusive rights to build and license Jeep. The intervening years saw Jeep passed on to other manufacturers. Willys was later sold to Kaiser Motors, which became Kaiser-Jeep, then American Motors. In 1987, the Chrysler Corporation absorbed American Motors, and today Jeep is part of Fiat Chrysler Automobiles (FCA). At times a money losing entity, Jeep today is the crown jewel for FCA. Today’s Jeep brand is a far cry from that original model. Its most recognizable vehicle may be the Wrangler, a traditional body-on-frame SUV with the closest resemblance to the original terrain warrior. However, all other models in the brand stable are of unibody construction, although each one offers “trail-rated” capabilities. The latest model is also Jeep’s smallest one. 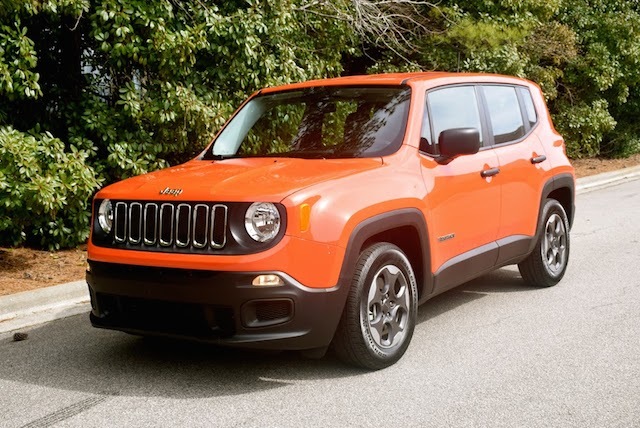 Introduced in 2015, the 2016 Jeep Renegade has the distinction of being the first Jeep not built in the United States. Indeed, along with the similar Fiat 500X, the Jeep Renegade is manufactured in Mefli, Italy, by Fiat. That’s a natural progression for a global automaker with manufactories on both sides of the Atlantic. That this is now the second Jeep sharing its platform with a Fiat product shouldn’t be a surprise — the current Cherokee was the first one and the upcoming replacement for the Compass and Patriot will become the third. By sharing the chassis, Fiat Chrysler effectively cuts its development and manufacturing expenditures. In any case, customers don’t seem to mind as the Jeep brand is one of the hottest automotive marques in the world. Indeed, in 2015 global Jeep sales rose by 21 percent, topping 1.3 million units. By 2018, Fiat Chrysler expects Jeep sales to top 2 million units as the Jeep brand is introduced to more markets. FCA’s long-term strategy is to partner or merge with another automaker; Jeep is the main prize it is dangling in an effort to attract a suitor. The Jeep Renegade slots in at the bottom of the brand’s lineup, one of a bevy of pint-sized subcompact SUVs on the market. The Nissan Juke and the Chevrolet Trax were among the earlier models in this segment, although in the 1990s you had the Kia Sportage and the Geo Tracker initially defining the category. Since then, the Sportage has been enlarged and is now officially a compact SUV. The Tracker is gone as well as its permutations. Other models in the segment include the Honda HR-V, Mazda CX-3, and the Subaru (XV) Crosstrek. Reviews of all three of these competitors plus the Juke are found on Auto Trends’ review pages. Suffice the say, consumers are turning to small SUVs just as small car sales flag. The Jeep Renegade is offered in standard front-wheel drive and available four-wheel drive. For 2016, the Renegade Sport initiates the six-trim-level model line and is priced from $17,995. Add $2,000 to get four-wheel drive. The test model supplied for this review was a Renegade Sport 4×2. The remaining models include the Latitude ($21,395), a special 75th Anniversary edition ($23,375), Limited ($25,120), a Dawn of Justice Special Edition honoring the upcoming Batman v. Superman flick ($26,250), and the top-of-the-line Trailhawk ($26,745). Thus, a fully loaded 4×4 model will come in very close to $30,000. At the same time, you should be able to find a generously packaged model for about $25,000. The standard engine for the 2016 Renegade is a 1.4-liter, turbocharged four-cylinder making 160 horsepower and 184 foot-pounds of torque. It comes paired with a 6-speed manual transmission only. Also available is a 2.4-liter, normally aspirated four-cylinder engine making 180 horsepower and 175 foot-pounds of torque. The larger engine comes paired with a 9-speed automatic transmission only. From the front, the Renegade’s fascia is all Jeep. This model has its own variation on the expected 7-vertical-slat grille theme along with traditional round headlamps. The lower grille opening is composed of small parking lights and embrasures housing the available fog lamps. From the sides, the silhouette becomes less Jeep-like and is similar to the now retired Honda Element. Its boxiness is apparent in a near upright windshield and long roof line, but is also eased somewhat by the curving belt line. Pronounced and squared wheel wells, profile character lines, and rocker panel trim are present. Notably, on the test model, Jeep provided a set of 16-inch aluminum wheels with a design that looks like it had an Allen key in mind. The rear fascia is all Renegade here or at least in the way it is laid out. The expected liftgate spoiler is present as is a wraparound rear window. Further, distinctive “X-shaped” backup lights are set within the rear combination light assembly, with each one embraced by square edging. Lastly, body sculpting and reflector lights are also present. The Renegade’s squared-off dimensions serve to deliver an open and roomy cabin. Seating is for five and five it shall hold. The tall roof line means there is ample head room everywhere with excellent shoulder, hip and legroom up front. To the rear, similar roominess is found, although legroom becomes tight, especially if the driver or front passenger insists on pushing the seat all the way back. Ideally, the rear seat would hold two and a pair of car seats would be just perfect. This model has 18.5 cubic feet of standard storage space, expandable to 50.8 cubic feet with the rear seat folded. However, to fold the entire rear seat flat, you may have to move the front seats forward. In any case, a 60-40 split-folding design means you have multiple seating arrangements and storage possibilities to work with. By design, the Renegade offers an open and almost utilitarian dashboard layout. You’ll find yourself training your eyes on the face forwarding dashboard, an “untroublesome” design, meant to emphasize this model’s SUV looks. The dashboard features a two-analog display with the tachometer marked with an orange flame splattered across redline territory. The speedometer is the other analog readout. Between the two is a digital driver’s information center — in 4×4 models a picture of the Renegade appears and shows which off-road mode you’re operating within. The center stack is neatly organized with two vents at the top, followed by the telematics display underneath. The test model was a bare bones arrangement with a small media hub featuring AM and FM access only. In the base model only, there is no XM radio and certainly no navigation. Fiat Chrysler’s desirable UConnect telematics system begins to show up at the Latitude level and gets only better as you move up. Further down the center console are dials, switches and knobs for managing climate and audio controls. At the base of the stack are the expected USB and audio auxiliary input port connectivity points as well as a 12-volt outlet. An open compartment designed expressly to hold your smartphone is also present. Splitting the bucket seats is the transmission shifter, two cup holders, and a tiny arm rest/covered storage compartment. Cloth seats are standard — a distinctive as well as a repeating Jeep log design covers the front seats. Both seats provide average support — they’re neither especially comfortable nor tiresome. The rear seat is about average too — my family neither praised them, nor condemned them — that’s a fairly important accomplishment considering most small cars are routinely weak in passenger comfort in the rear department. All four doors feature bottle holders and there are additional pockets in the rear storage area. A huge grab bar is located just above the glove box, perhaps to give the front passenger something to hold onto as the Renegade navigates uneven terrain. I must confess an important point as we consider the Renegade’s on-road capabilities —sorry, I cannot comment on its off-road prowess, given the model at hand. initially, I didn’t like the Renegade’s stick shift with a turbo engine arrangement. Specifically, I found it was underpowered and underwhelming, but to be fair the Renegade showed up just as a Camaro SS equipped with its own 6-speed gearbox had left. Quite frankly, there can be no comparison between the two models. The problem I had at first was finding the right gear for the moment. I soon discovered that both the third and fifth gears provided the momentum needed to move forward, necessitating down shifting from time to time to obtain the impetus I sought. Happily, I soon became familiar with the SUV’s performance sweet spots and used that knowledge to my advantage. It turns out the Renegade is a zippy little model and the gearbox works just fine. Sometimes, you have to spend a little extra time finding the right gears to make your move. For everyone else, the larger engine may be the best choice, especially for off-road purposes. The larger four and the automatic transmission allow you to concentrate on getting where you’re going without concerning yourself with shifting. One other note: the Renegade 4×2 provides 6.7 inches of ground clearance and 7.9 inches with most 4×4 models. Choose the trail-rated Trailhawk and you’ll enjoy 8.7 inches of ground clearance. You also have access to Jeep Active Drive Low in an effort to help pull your Renegade out of your local mud slough. Deciding for Jeep means understanding a series of SUVs are now available and still more are to come. The next step up from the Renegade is the Patriot and Compass, but both models will be replaced later this year with a new SUV bearing one of the names. Rumors of the new Jeep debuting later this month at the New York International Auto Show persist. You also have the Cherokee and Grand Cherokee to consider as well as the burly Jeep Wrangler and its wonderful off-road credentials. And if Jeep is your thing for the long haul, expect at least two new models to follow in the coming years, including a full-size Grand Wagoneer as well as a pickup truck. The one notable downside here is that Jeep’s quality ratings have no where to go, but up. Indeed, both Consumer Reports and J.D. Power have dinged the Jeep brand, although consumers apparently are not fazed by the low ratings. Taking advantage of standard warranties and perhaps buying an extended warranty may reduce these worries, although in opting for the latter, you may find the cost comes in greater than the repair benefits. 2016 Jeep Renegade photos copyright Auto Trends Magazine.